Potassium is a macromineral/electrolyte, which means it is required in a large amount by your body. Potassium is essential for healthy cardiac function. Different medications can affect your potassium levels, and not consuming enough of this essential nutrient can result in a condition known as hypokalemia. Hypokalemia can occur after an illness that has caused vomiting and diarrhea, and often shows no symptoms until potassium levels get quite low. Symptoms then can include weakness, muscle cramps, heart palpitations, low blood pressure and fatigue. Too much potassium is also harmful to your body and causes hyperkalemia. It can also show no symptoms. When it does have visible effects on the body, many of them are quite similar to hypokalemia so be sure to mention them to your doctor if you find them worrisome. Increases Brain Function: High potassium levels act as a vasodilator, allowing blood to move easier through the blood vessels. This blood carries oxygen, and when more oxygen reaches the brain, it increases the activity levels and cognitive abilities. Normalizes Blood Pressure: Potassium works to balance the blood pressure and counteract the effects sodium has on raising it. This, along with the previously mention vasodilation effects, help to reduce the risk of hypertension and heart disease. Reduces Anxiety and Stress: Ingesting potassium assists with regulating a variety of hormones in your body, including those produced as a result of stress such as cortisol and adrenaline. This helps to reduce the feelings of anxiousness and tension that you may be experiencing. Increases Metabolism: Potassium helps your body extract nutrients from what you eat and helps to break down and process nutrients. It also plays an important part in the creation of protein, which directly affects other bodily systems. Improves Muscular Health: A diet that is adequate in potassium will help maintain strong muscles. Potassium helps muscle tissue grow properly, and effectively use the energy that is created during the metabolism process. When there is a deficiency of this essential nutrient, muscles may become paralyzed, including the muscles surrounding the heart. Aids Nervous System: Your nerves send messages to various parts of your body. Potassium helps to make the transportation of these signals easier and more efficient. This improved functioning helps your muscles perform better. Consuming these foods will help ensure you are receiving an adequate supply of potassium through your diet. 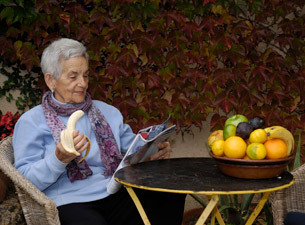 At The Holiday Retirement communities, we offer a wide selection of nutritional meal choices to promote healthy living, a fit lifestyle, and appeal to a wide variety of palates. There are games, crafts, activities, and programs to help seniors live their life to the fullest and enjoy themselves. With regular excursions and outdoor events, we provide many different options to help keep our residents engaged, active, and happy. We take care of each one of our residents like they are our own family. You might also want to check out our post on “Nutritional Needs Change as We Age” that will help you take care of your older loved ones. Call us at 860-233-8208 to learn more about the services and amenities we provide at our retirement communities in Rhode Island and West Hartford, Connecticut. Fill out this online form if you would like to book a tour.